In an unassuming shopping center on the corner of North Country and Sound Roads in Wading River, across from the duck pond, is one of the area’s best coffee shops. It has only been opened for six weeks, but there is already a stream of locals who stop at Hudson Market every morning for the proper cup of coffee the sign out front promises. The space is small and smells deliciously of fresh coffee — a far cry from the accounting office the space once was. Owner Anthony Coates, who was involved in politics in Suffolk County for about 40 years, transformed the yellow-tinged off-white walls and moldy shag carpeting into a quaint, sunny spot to get a cup of coffee and read the day’s newspaper or a book, which he says many come in to do. Hudson Market is just one of North Brookhaven’s new eateries that has quickly become a community favorite — the Flying Pig Café on 25A in Miller Place and Go Burger on the same route in Mount Sinai are other spots that opened within the past few months and have been embraced by locals. Two other new food businesses to the area are Lemongrass Asian Fusion in Mount Sinai and Burrito Palace and Grill in Miller Place. The summer season is often the busiest season for restaurants. Aside from supplying other dining options, Councilwoman Jane Bonner (C-Rocky Point) pointed out that with new eateries come new jobs. According to the National Restaurant Association, restaurants in New York are expected to add the highest number of summer jobs of any other state — over 44,400 of them. That idea — of opening a restaurant that served something not offered by another place — is what led Marianne Ferrandino to open the Flying Pig Café with her husband Jack Schwartz six months ago. The pair owns another restaurant in Center Moriches, called the Country Cottage, but they live in Miller Place. Modeling the new restaurant’s concept after Sarabeth’s in New York City, the Flying Pig Café serves upscale American comfort food with new specials each week, but offers it in a much different setting, with ceramic pigs and canvas paintings modeling the large spotted pig statue outside. For breakfast, customers can get traditional eggs, omelets and pancakes, but they can also get the Café’s more playful breakfast burger, granola crusted French toast and crab Benedict. Ferrandino recommended the famous cinnamon bun pancakes. The lunch offerings at the Flying Pig Café are just as creative as the breakfast ones — the cranberry almond chicken salad is a best seller, and the half-pound burger options are popular as well. Ferrandino said the burgers are made with a custom blend of ground beef and served on a big brioche bun. She added that the Flying Pig Café also uses artisanal breads baked especially for them. Breakfast and lunch are the two most popular meals — breakfast on the weekends and lunch during the week. Both are served seven days per week, with dinner offered Thursday through Saturday. Ferrandino recommended the homemade herbed meatloaf and gravy, braised short ribs and half herb roasted free range chicken. Prices at the Flying Pig Café range from $4 to $12 for starters and salads at $7 to $18 for entrees. Dinner is a bit more expensive. 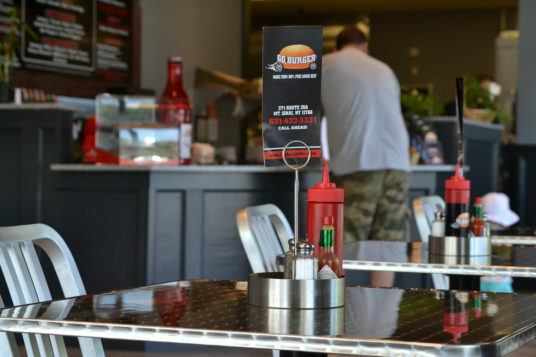 Serving good food to customers is also something the owners of Go Burger value. Christine Donofrio, who owns the joint with her husband Philip, said their motto is “fresh, quality and family friendly.” She said the burgers are delivered fresh every day from a top New York meat distributor; the potatoes are the top-grade ones available each season and are fresh cut each day; and the ice cream, the only thing ever frozen, is from a company that specializes in the treat. 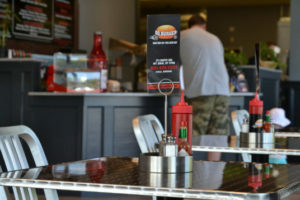 Go Burger started as just a food truck on Middle Country Road in Ridge near a pizzeria the couple owns. The Donofrios were looking to open another truck but realized they would be limited in the amount of food they could serve because any new truck would not be parked as close to one of their other businesses. When an opportunity arose to buy the L.I. Burger brick-and-mortar location in Mount Sinai, they took it. Customers from their truck come to this location for dinner — Donofrio said they love that they can sit inside and eat. This location allowed for an expanded menu from the one on the food truck. Starters, such as onion rings, sweet potato fries and a cup of chili, were added to the restaurant’s menu, as were salads and desserts. The real deal ice cream sandwich, made with in-restaurant baked chocolate chip cookies and ice cream, is the most popular of the newly added desserts. A customer favorite that was carried over to this location is Go Burger’s milkshakes, which come in the traditional flavors of vanilla, chocolate and strawberry as well as the weekly specials Donofrio concocts. Nothing on Go Burger’s menu is over $9, unless a customer adds a lot of extra toppings to a burger. The restaurant is opened daily, but if you’re in the Ridge area, you can still find the food truck if you’re looking for a quick fix. For Anthony Coates, opening Hudson Market was a “labor of love.” He was running for Riverhead Town Supervisor in 2015 and jokingly said that if he was not successful, he would open a shop in the strip across from the duck pond. Hudson Market specializes in coffee — it is the only thing made in-house. Coates said he searched high and low for the best quality coffee beans he could find, and he cycles between the blends he found, such as variety coffee roasters from Brooklyn. He also searched for the best types of coffee prep machines to brew the “hearty” cup of coffee he was after. Coates organized this business, where prices range anywhere from $2 for a regular cup of coffee to $4 for specialty coffee drinks and is open daily from 7 a.m. to 4 p.m., with few moving parts so it was easier to run. “Everything here is miniaturized,” he said, smiling. After looking around at other businesses in the area, he decided Hudson Market would exclusively focus on making excellent coffee beverages as opposed to also preparing bagels or breakfast sandwiches, which customers come in asking for sometimes. “I didn’t want to set up a ‘me too’ business,” he said. Customers can purchase baked goods, such as muffins, scones, biscotti and cookies, made by D’Latte in Greenport. Hudson Market also carries bottled drinks, New-York-style hot pretzels, cinnamon buns (but only on the weekends) and pies during the holidays. Neighborhood children ride up on bicycles in the afternoons and scrape money out of their pockets for candy he stocks specifically with them in mind. His inspiration was the many businesses that were community touchstones in the Three Village area where he grew up. The interior of Go Burger in Mount Sinai resembles the feel of the companys food truck which is stationed in Ridge. Photo by Rebecca Anzel. 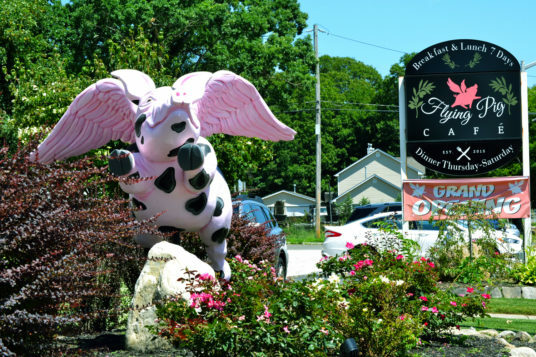 The exterior of The Flying Pig Café features a pink and black-spotted exterior, along with a statue of a spotted pig with wings. Photo by Rebecca Anzel.